As I usually do when I review a movie, I will first give the basic plot of the movie and give my opinion about it and rating at the end. The Lego Movie is an animated movie based on the world famous Lego toys. At the beginning of the "The Lego Movie," we meet a wizard named Vitruvius who has devoted himself to protect a super weapon that is called the "Kragle. "He is invaded by an evil villain named Lord Business who goes in with his men and takes the "Kragle. As Business is leaving, Vitruvius warns Business about a prophecy that predicts that the "Special" will find a Piece of Resistance that is capable of stopping the Kragle. Lord Business has the Kragle for over eight years when we meet an ordinary construction worker named Emmet Brickowski. Emmet is a very organized man who plans everything in his life and devotedly follows written rules. He does not have many friends but is a happy guy as he tries to make the best of his life. He goes to his job and tries to fit in with the other guys at the construction site, but he never does quite fit in. One day, when work is over, and everyone has left the job site, Emmet sees someone on the site. He warns the person that they should not be there. He then goes to his written notes of what to do in a situation like this and is about to make a phone call when he realizes that the person is a beautiful girl. The girl, named Wyldstyle, is looking for something at the job site. As he investigates, Emmet falls into a pit and finds the Piece of Resistance. He looks for his notes on what to do but cannot find them. He wants to touch it and starts approaching it. As he is doing so, he walks over his notes that say to not touch it, but he does not see the notes. The next thing Emmet knows is that he is in the custody of a cop after passing out. The Bad Cop, who seems to have a temper problem, starts interrogating Emmet who has the Piece of Resistance attached to his back. The Bad Cop, who also has a Good Cop split personality tries to get Emmet to tell him everything he knows. Emmet, confused about everything, does not know what is going on but the cop does not believe him. The cop, who is Business' lieutenant, lets him know about Business' plans to freeze the world with the Kragle which is reality is a tube of Krazy Glue with some letters rubbed off. Wyldstyle then comes in and rescues Emmet, and they go on a crazy chase in which they get away from. Wyldstyle takes Emmet to Vitruvius and explains that Emmet is a master builder like her. She also revels to Emmet that there are many different types of lands. Emmet, who is used of his metropolitan Lego life, finds that there is a western type Lego world and many others. She explains to him that Business separated all of these worlds long ago. These master builders can build things fast without manuals whenever they need it just as Wyldstyle did to help them escape the bad cop and his men. People like this were captured by Business and put away so they would not disrupt the way things should be. Emmet is thought to be the "Special" that was prophesied many years ago. They are disappointed though when they find that Emmet ha no creativity. With everyone captured and locked in separate cages, Lord Business makes sure that a self destructing battery is hooked on to Emmet. Business also betrays Bad Cop there and tells him that it is nothing personal and that it is just business. With everyone left to die with a blast, Emmet only has a few seconds to do something and self sacrifices himself by jumping off of the edge of the universe. Wyldstyle, Bad Cop and everyone else then rally themselves behind Emmet's bravery and take Emmet's advice to work as a team by building creative weapons to fight Business and his men. After his jump, Emmet finds that he is on the floor in a real world. The movie takes a twist here as we learn that everything that we have been watching in the movie so far is all being played out by a little boy. Finn, who does not supposed to be playing with his father's Lego set up is then caught by his father and scolded for it. The father places Emmet on a table and tries to fix everything that his son destroyed but then has to leave the room. Finn, realizing that Emmet and his friends are still in trouble, returns Emmet and the Piece of Resistance to the Lego set. Emmet creates a giant robot to assist in the fighting against Business. When Finn's father returns, he realizes that his son based the evil Business on him and decides that he will no longer be greedy with his toys. Emmet makes a speech that convinces Business that he is special too and Business has a change of heart and destroys the Kragle with the Piece of Resistance which is the top cap of the Krazy Glue. Emmet and all of his new friends celebrate and Wyldstyle becomes his girlfriend as Batman approves. The movie ends with a setoff new villians appearing. These villains are created by Finn's little sister, who also had permission to play with their fathers Lego set. 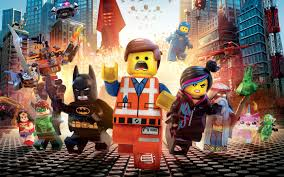 The Lego Movie had a lot of creativity and was better than what I thought it would be. I loved the Kragle - Krazy glue thing that they put in to this movie. The Good Cop - Bad Cop split personality was also funny. Whenever bad Cop turned in to Good Cop, the face would spin around to the personality that was present. The different Lego worlds was also pretty cool. We all know that we can buy Lego sets that are of so many different kinds of worlds. Having Batman and other super heroes that we all know also made the movie more entertaining. When Emmet is in the real world, it was kind of shocker that throws you off for a second until you realize what is going on. I thought that was pretty cool though and added to the movie. The Lego Movie is a good movie for someone to take their kids to watch. Adults will also enjoy it, but don't expect a movie that you will never forget. Like I said, you will not be bored with it at all and will find yourself really into it.